Let’s break down Wellness Coaching and define Wellness and Coaching separately before we go on. The World Health Organization states, “Wellness is an active process of becoming aware of and making choices toward a healthy and fulfilling life”. Wellness is more than being free from illness. It is a dynamic process of change and growth. 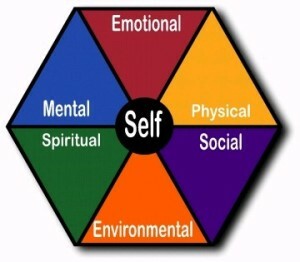 Dimensions of wellness include physical, emotional, intellectual, spiritual, social and environmental. First, let’s talk about what coaching is not. Coaching is not therapy or counseling. Coaches do not tell clients what to do. Instead, they focus on the present rather than the past, while you mobilize your inner strengths and external resources in order to make changes in your life. Trying to make lifestyle changes in habits and thinking can be pretty tough when attempting to go it alone. Have you ever wondered what creates the gap between what you say you want and what you actually do? Like most of us, this familiar path of hope and defeat, when repeatedly frequently, results in feeling powerless over our health, weight, fitness, mental and emotional selves. Wellness Coaching can close this gap by helping clients overcome resistance to change by using a structured approach that begins with the client discovering their answers to what they truly want, why they want it and what is stopping them. Clients envision a life as healthy and well as possible, then identify a behavior they want to change, make an action plan and break it down into small confident steps. The coach is there for support, accountability, helping overcome challenges and to recognize your progress. Wellness Coaches excel at helping people make lasting lifestyle changes. If you or someone you know is ready to make lifestyle changes, please contact me. I would love to share how working with a Wellness Coach can guarantee your success.